Take some stress away from the already stressful process of anticipating a tropical storm or hurricane. Get your home or business ready for a storm before it even gets here! You know living in Florida that we will at least get one storm per year (and that’s extremely conservative), so preparing for upcoming storms is definitely not a waste of time. If you already have loose, hanging branches, unstable trees or trees that are very close to your roof, garage or pool… take care of them NOW! You don’t want to be on a ladder when the winds pick up trying to take care of your landscaping problems. Tree trimming companies will not be available due to demand and home improvement stores selling landscaping tools you might need will be jammed with people trying to buy last minute supplies. Take care of lawn needs in the weeks before a hurricane hits so you can do so in a stress-free environment! Whether you decide to board up your windows with plywood, procure hurricane shutters or get impact glass on your windows… prepare for this today. If choosing plywood: Go ahead and buy the amount of plywood you will need now before home improvement stores sell out before a storm. Make sure you have the necessary amount (if not extra) screws, bolts and power tools to put the plywood up when a storm comes. You will be thankful you have plywood when the home improvement stores no longer have plywood in stock! If choosing hurricane shutters: Get quotes and have your hurricane shutters installed as soon as possible if you do not have them already. If you already have hurricane shutters, make sure you have the necessary screws and bolts to secure them to your windows or lock them. If choosing impact glass: Get quotes and have your impact glass installed as soon as possible. Window companies will not install impact glass once a storm starts approaching. will become flying hazards to not only your home but your neighbors home in the event of even the smallest hurricane. 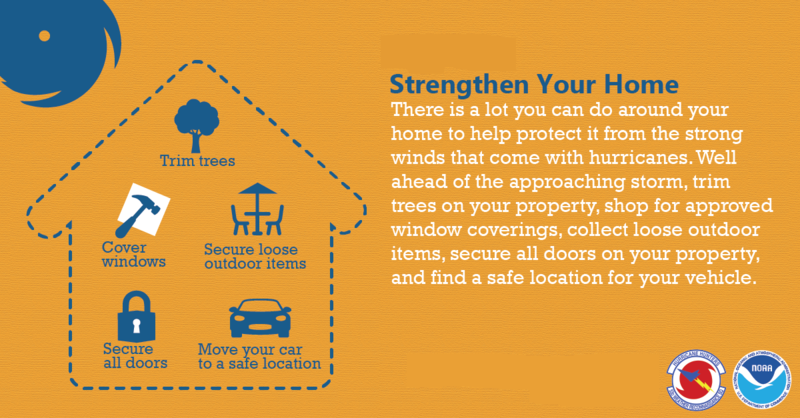 Take an inventory of your outdoor items, create a list so you can know exactly what you need to put away once a storm hits. Take the time to inspect your doors prior to a storm approaching. Make sure all door frames are strong, repair any issues that might be present with doors and check locks so doors are ready to withstand the pressures hurricane winds. If there isn’t space in your garage to store your car… now is the time to make space! You need to have a safe place to store your car in the event of a hurricane so you will have a reliable vehicle after the storm. Cleaning out a garage can be quite a time-consuming project and is not something to tackle with an impending storm. Get your garage organized today!